I’ll refrain from thrashing about the shrubbery and say right away that these animals are in fact lions. How then, did they come to be called dogs by some? We’ll come to that momentarily, but first we must look to India. 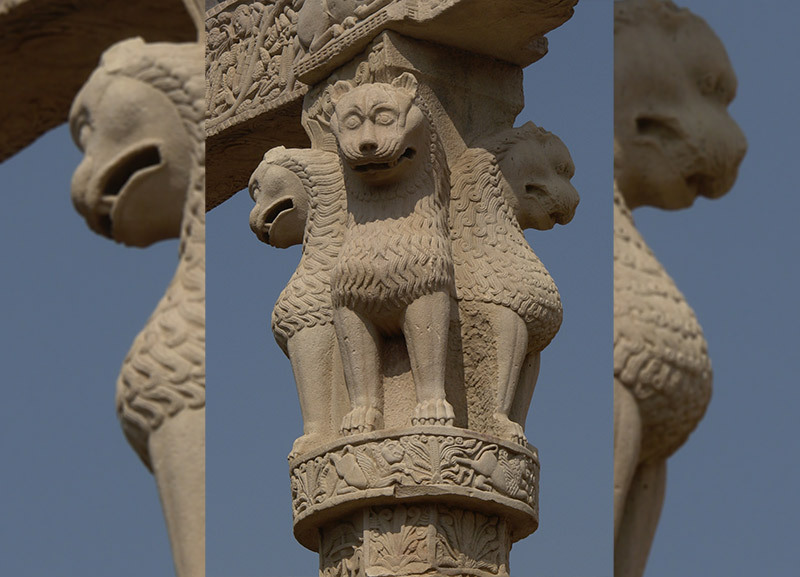 There are also ancient lion statues in Middle Eastern countries, but India is the surest place to begin the lion statues’ path to Japan, for it seems to have moved along with the Buddhist faith. Lions appeared in Indian temple art and, as early as the third century, showed up in Chinese Buddhist art. In those times, the lion was a symbolic protector of the dharma (the teachings of Buddha). “If it’s good enough for Buddha, it’s good enough for the emperor,” may have been the line of thought, for, over time, they also became protectors of imperial gates. Here the history seems to become a bit unclear. 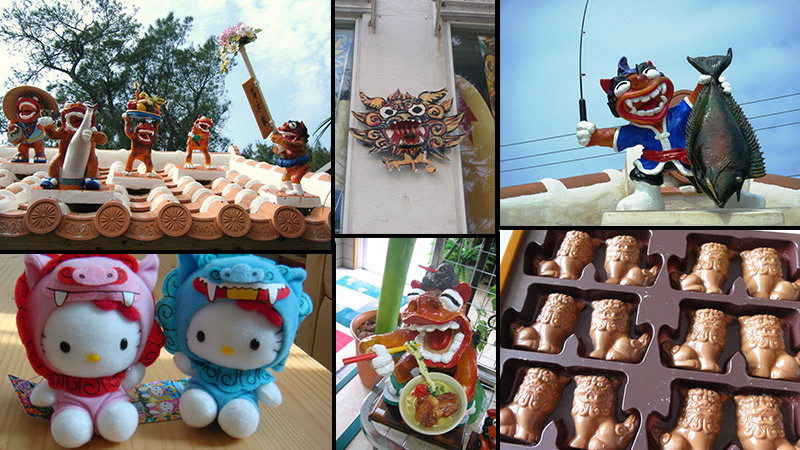 The Chinese word for lion (statues included) is shi 獅 or shishi 獅子, but there was another creature that appeared in China at around the same time called the xiezhi 獬豸. At some point between the third and seventh centuries, paired stone xiezhi also made their way to Korea, where the name was pronounced haetae or haechi. The haechi appears very lion-like, but often has a scaly body, a small horn on its head, and sometimes small wings. By the Nara period (710-794), lion guardians had come to Japan as well. I found nothing to indicate whether the original source of their introduction was China or Korea. Early on, they were usually made of wood and only used indoors. In the ninth century, a change occurred, and the pair came to consist of one open-mouthed lion (shishi 獅子) and one close-mouthed, horn-bearing, dog-like komainu. 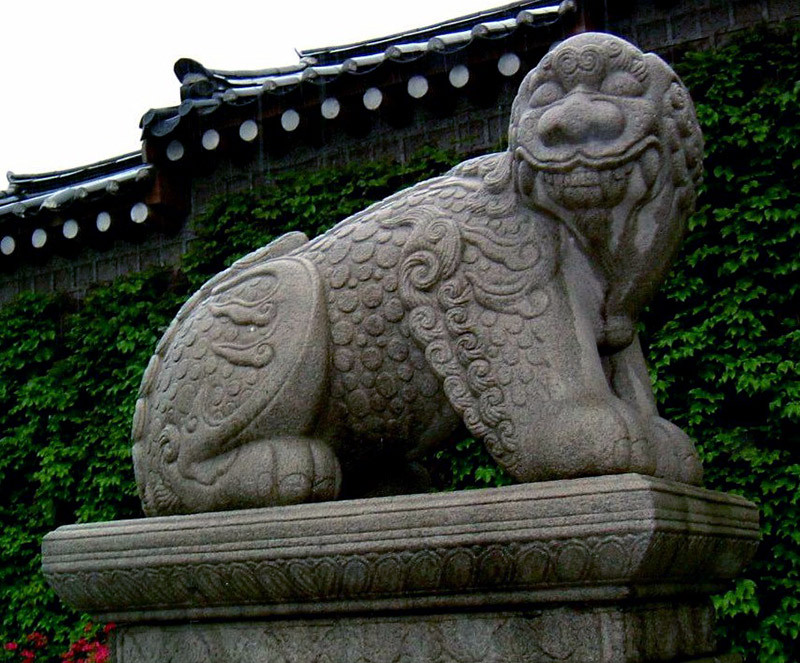 The name komainu itself means “Korean dog.” Given the name and its horn, it would seem that the komainu, at least, came from the Korean haechi. 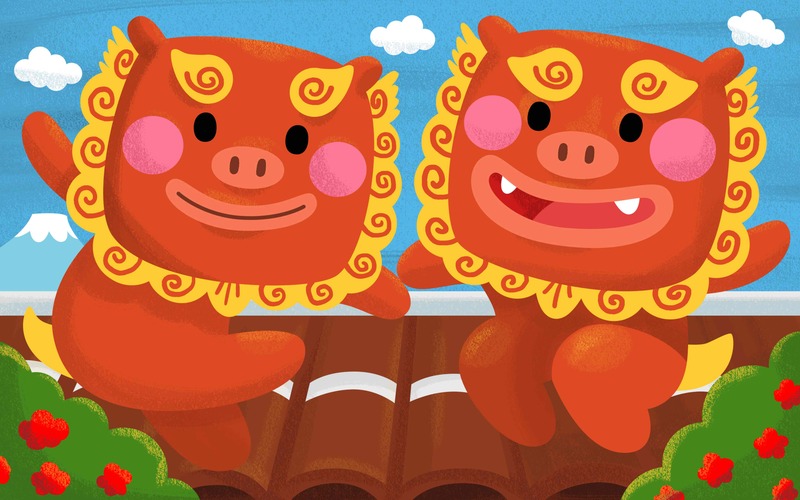 By the fourteenth century the horn disappeared, and both animals of the pair came to be known as komainu. At the same time, people started making them in stone and using them outdoors. Again, the history seems to be vague, and I found no sources to solidly confirm how komainu came to be ubiquitous at shrine entrances. This is only me theorizing, but I think it likely that lion guardians may have initially been associated with Buddhist temples. I say this because of the lions’ Buddhist associations in China, and the early Korean influences on Japanese lions (Buddhism having been introduced to Japan from Korea in 552 CE). 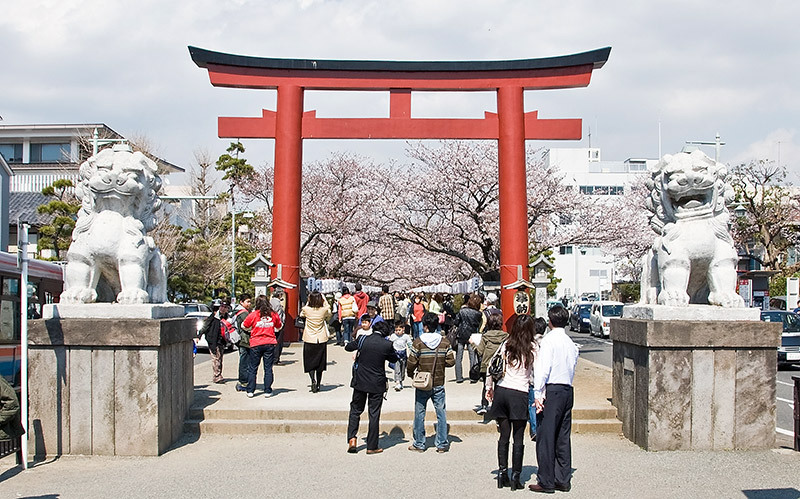 If this was the case, the shift from temples to shrines could be explained by the fact that they often shared grounds and, in trying to spread the faith, Buddhists often drew parallels between characters and symbols of their religion and those found in Japan’s native beliefs. You may be wondering if anyone in pre-modern Japan had ever seen a real lion. It’s a long way from the savannah, but there are Asiatic lions as well. Although their range is quite small today, prior to the nineteenth century they could be found throughout Persia, Palestine, Mesopotamia, and much of India. Captive lions were also known in China. I was unable to find any sources confirming or denying the presence of captive lions in Japan. However, during the Tokugawa periods, exotic animals were sometimes featured as part of festivals, so there is a possibility. Still, I think it’s safe to say that the vast, vast majority of Japanese people had never seen a real lion prior to the modern age. When seen in pairs, both in Japan and Okinawa, one lion usually has its mouth open while the other’s is shut. It’s no coincidence, but rather Buddhist symbolism. The open mouth is meant to be forming the sound “a” あ, while the closed mouth is forming the sound “un” うん. Combined, they form the word a-un, the Japanese rendition of the Indian word om ॐ. Originating in Hinduism and adopted by Buddhism, om’s meaning seems somewhat vague at times, but is sometimes described as the name of God or the sound of the vibration of the universe. At least in Japan, “a” and “un” are also symbolic of beginnings and endings, in the same way that Western countries use alpha and omega. It’s also sometimes said that the open-mouthed animal is male, while the other is female. 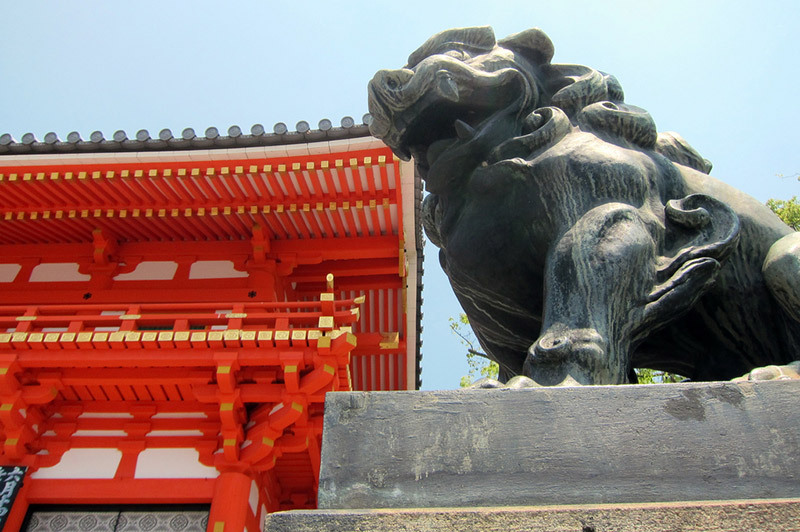 In Japan lion statues are a fixture on shrine grounds, but seldom seen elsewhere. 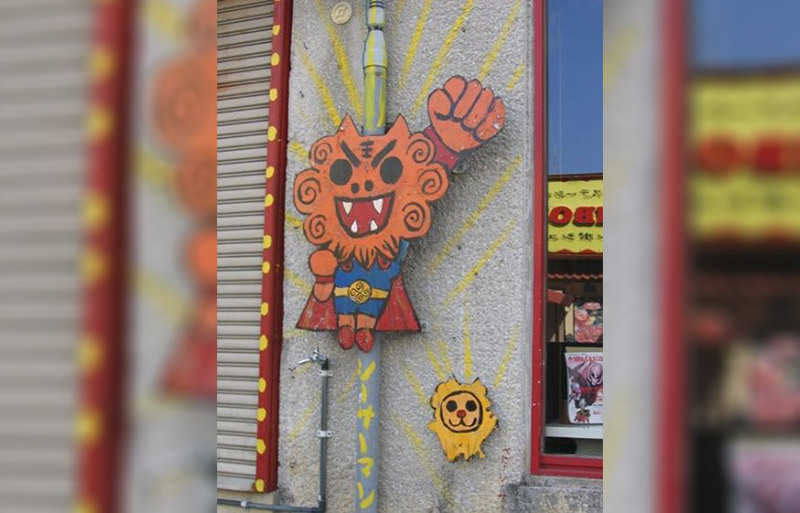 On the other hand, anyone who has been to Okinawa will know you can’t swing a cat without hitting a lion, though you probably wouldn’t want to do that. I’m sure the cat wouldn’t appreciate it, and the lion might take offense at your mistreatment of his cousin. That said, lion statues are omnipresent in Okinawa. 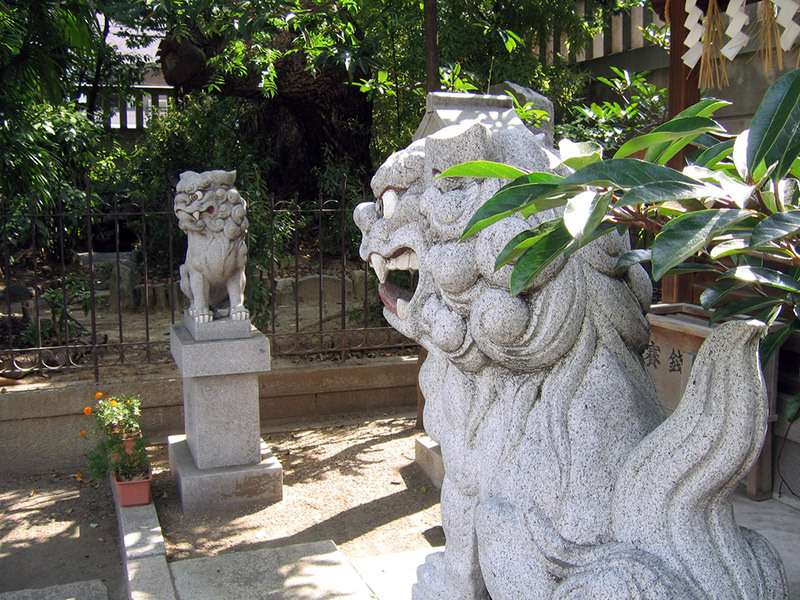 In Okinawa lion statues are known as shīsā, meaning lion. They are made of a variety of materials, though the signature regional choice is red clay. They can be found not only at areas of special spiritual significance, but on the roofs or at the entrances of homes and businesses. It’s also easy to acquire your own shīsā, as statues of all sizes are nearly ubiquitous among souvenir shops. A Chinese envoy brought a gift for the king, a necklace decorated with a figurine of a shisa. Meanwhile, at Naha bay, the village of Madanbashi was being terrorized by a sea dragon that ate the villagers and destroyed their property. One day, the king was visiting the village, when suddenly the dragon attacked. All the people ran and hid. The local priestess had been told in a dream to instruct the king when he visited to stand on the beach and lift up his figurine towards the dragon; she sent a boy to tell him. The king faced the monster with the figurine held high, and immediately a giant roar sounded throughout the village, a roar so deep and powerful that it even shook the dragon. A massive boulder then fell from heaven and crushed the dragon’s tail. He couldn’t move, and eventually died. At Tomimori Village in the far southern part of Okinawa, there were often many fires. The people of the area sought out a Feng Shui master, to ask him why there were so many fires. He believed they were because of the power of the nearby Mt. Yaese, and suggested that the townspeople build a stone shisa to face the mountain. They did so, and thus have protected their village from fire ever since. shīsā also feature in some much more modern stories. King Shīsā キングシーサー, a giant monster based on a shīsā, first appeared in Godzilla vs. Mechagodzilla in 1974, and again in 2004’s Godzilla: Final Wars. In the English dub his name was changed to King Caesar, which seems a bit redundant. In his first appearance, King Shīsā was a benevolent protector of humanity, but had been sleeping inside a mountain in Okinawa for a long time. When Godzilla alone cannot defeat his robotic doppleganger, the human heroes of the film awaken the ancient King Shīsā with a very non-ancient sounding song. 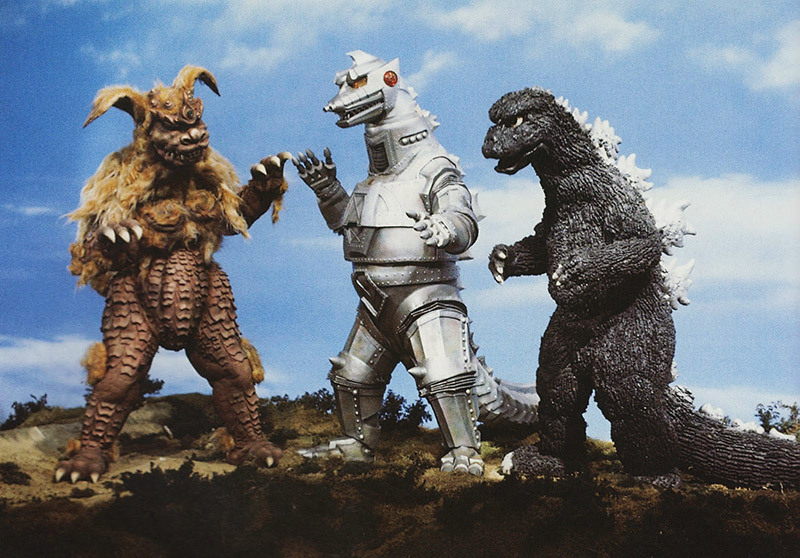 Then King Shīsā and Godzilla team up to pound Mechagodzilla. In Godzilla: Final Wars, King Shīsā fights against Godzilla, but since he was being controlled by aliens we won’t hold it against him. In these movies, King Shīsā favors close combat, although he does have the ability to redirect an opponent’s energy attacks. 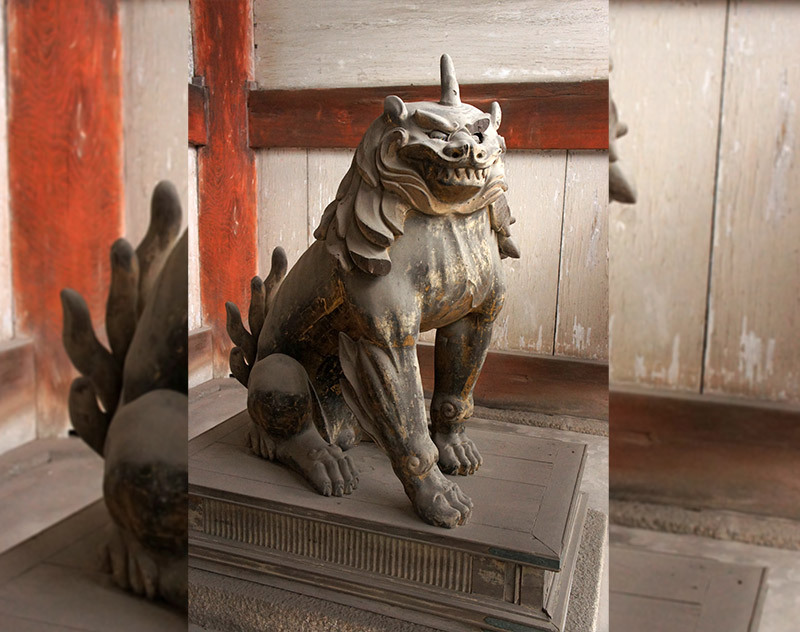 Though a lot of their past remains unclear, guardian lions are fascinating. Although there are tons of komainu to be seen at shrines across Japan I’m sad to say that I haven’t seen them utilized much in modern pop culture. Maybe some of you out there know of some examples of which I’m unaware. On the other hand, the Okinawan shīsā is very much a living symbol, so at least this overlooked legend has a happy home in Ryukyu. Okay, that's all from me!